Being pregnant is probably one of, if not the, wildest experience a woman will ever go through. The body undergoes a major transformation that includes a slew of unpredictable changes. Some feel good and others are simply the worst. Your hair may be long, thick and shiny, but your skin could be in the middle of its worst breakout since sophomore year of high school. You just never know how your body will react to the hormonal roller coaster that is pregnancy. Ahead, two dermatologists with years of treating budding mommas break down the most common changes that occur during one of the most exciting (and challenging) times in a woman’s life. Everyone’s experience will be completely different, but overall, there are three main skin concerns that are pretty pregnancy-specific. Melasma is the most common. It’s a condition that causes areas of the facial skin to darken. While melasma isn’t exclusive to pregnant women, it’s more common among them. There’s also a chance of developing new allergies when pregnant. Board-certified dermatologist, S. Manjula Jegasothy, CEO and founder of Miami Skin Institute, says these types of allergic reactions mostly manifest as hives. And then there is hormonal acne. Fluctuating levels of testosterone, estrogen and progesterone in your body can bring on the breakouts, and because of the laundry list of products you shouldn’t use while carrying, treating acne can be tricky. You’ll likely have to overhaul your entire regimen to both avoid any bigger skin issues and ensure the safety of your budding babe. Melasma can be controlled during pregnancy by minimizing time in the sun, especially without sunscreen. Ladies, SPF is a must! The discoloration caused by melasma generally fades within a few months after delivery. If it doesn’t, you can reintroduce certain ingredients back into your regimen to help even things out faster. However, dermatologist Amy McMichael advises against cocktailing your own acne remedies. “It’s best not to use too many mixtures of products found over the counter, even if they are labeled as ‘natural,’” she says, as they may have additives that are dangerous. Instead, McMichael recommends using gentle cleansers and moisturizers with fruit acids like glycolic acid or salicylic acid. “Some dermatologist use topical clindamycin, which is a prescription antibiotic, that helps calm inflammation,” says McMichael. On the not-so-frequent occasion the acne flare-up is major, McMichael says that a doc can use a baby-safe oral antibiotic. “This is usually only initiated in last trimester of pregnancy,” she notes. 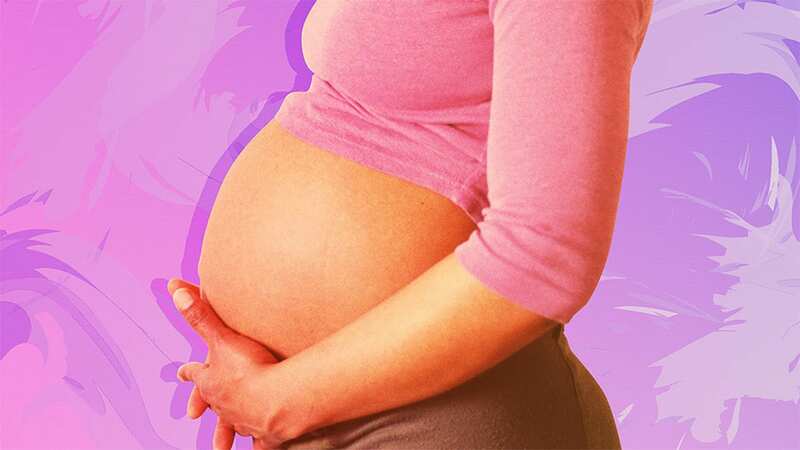 “The most important ingredients that women should avoid when they are pregnant are vitamin A derivatives, such as tretinoin (Retin-A) or retinol,” says Jegasothy. They have been linked to birth defects. She adds that while vitamin A-related birth defects have only been documented with the oral ingestion of it, it’s best to play it safe and avoid retinoid-derived skin care all together while pregnant. Instead, Jegasothy suggests adding products with antioxidants such as vitamin C and botanicals like resveratrol. More often than not, women will have some of their best hair ever during pregnancy. Sure, the prenatal vitamins may help a tiny bit, but the real reason your hair is long and thick is because it’s actually not shedding while you’re pregnant. McMichael explains that the growth phase of our hair is usually 3 to 5 years, and there should be about 8 to 10 percent of hairs shedding at any given time. However, during pregnancy, the hairs that are supposed to shed don’t. In short, you have a lot more hair on your head than you should. Where many women experience a shift for the worse with their hair is post-pregnancy. Once our bodies start to balance back out from all of the hormonal changes they just went through, hair kind of gets caught in the crossfire. The energy needed to keep it growing is eaten up by other areas of your body. And once the normal hair-shedding process cranks back up again, all that strand buildup from pregnancy will fall out. It seems like you’re losing a ton of hair, when in reality, it’s what you would have lost over time anyway. As for what you should or shouldn’t do with your hair during pregnancy, McMichael advises easing up on hair coloring and/or chemical relaxers even though there is little data available on this topic. Let’s clear some things up about stretch marks. First off, they are genetic. Whether or not you get them is unfortunately already written in your DNA. It’s one of the few pregnancy skin issues that isn’t hormonally mediated. But just because it’s in your blood doesn’t mean you can’t help minimize how much your skin actually stretches — the keyword here being minimize, not prevent. “Keeping the skin lubricated with thick, bland moisturizers is imperative,” says McMichael. Additionally, make sure you’re using gentle soaps that won’t dry you out. Keeping skin super-hydrated can also help lessen skin sagging after the baby is born.